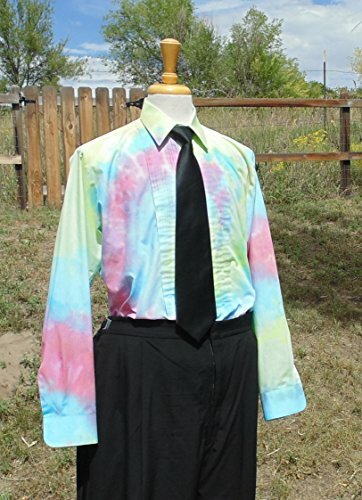 Hand Tie-Dyed tuxedo shirt! This classic front pleat shirt has a full collar and was part of a stock of rental tuxedo shirts that was retired when the shop went out of business. I have re-fashioned it by hand dyeing it in a very cool spiral pattern. This listing is for the shirt only and the vest, tie and pants are for display only. This would not only be great for Prom or formals, but Custom orders can be made for whole bridal parties. If you have any questions about this product by Fru Fru and Feathers Costumes & Gifts, contact us by completing and submitting the form below. If you are looking for a specif part number, please include it with your message.